Chapter 5 extract: The original Inveraray course in the grounds of the castle was opened in 1893 but, as with many golf courses, war brought temporary or permanent closure. The original course was closed at the start of the Second World War and the establishment of C.T.C. Castle Camp ensured little remained by its end. Much in the way the town was relocated by the 3rd Duke of Argyll on aesthetic considerations, the 10th and 11th descendants took a similarly dismal view of the great unwashed playing golf in the Castle grounds. The course remained closed until 19th June 1993 when it was re-opened by the 12th Duke at an appropriate distance from the castle, on the southern side of town. The date coincides with the club’s centenary although for 54 of those years there was no course, a period roughly equivalent to the time it took to relocate and rebuild the new town. The drawing shows the first across the pond with the remains of the old cook house to the right of the trees and the pin. 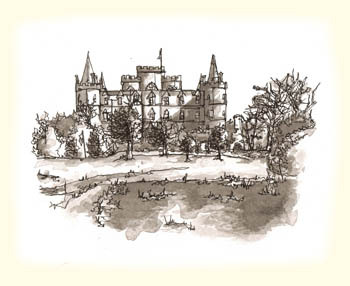 An impression of Inveraray Castle is portrayed in the background, dominating the scene in the way it once dominated the old course.